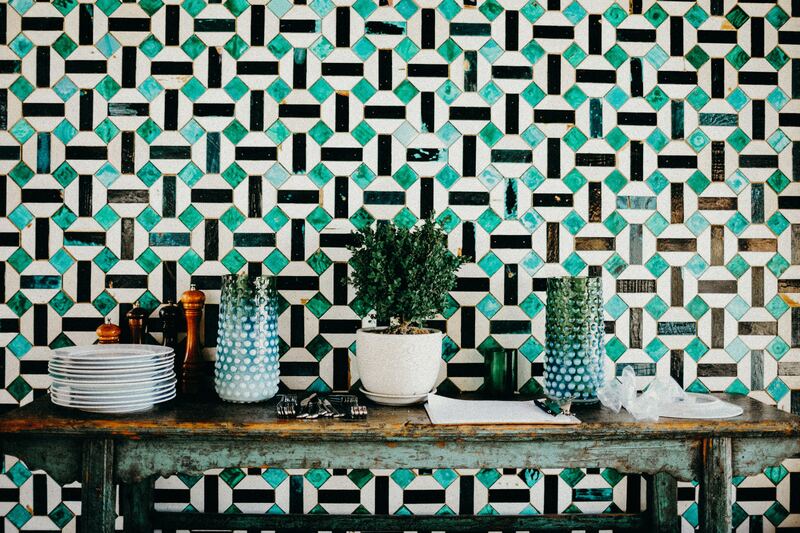 Last week I shared a few of our favorite tile patterns, which can be used for kitchen and bathroom backsplashes and even flooring. This week I want to tell you about a few concepts that we interior designers use to pick the perfect tile pattern. If you don't have a design background, some of these considerations will likely be new to you, but I guarantee you'll be glad you thought about them before your grout dries. You definitely don't want to make the wrong tile choice. Now let's get to work! When deciding what tile to use in your new space, there are many considerations. At CRD, we start with three major features: function, aesthetics, and cost. Each project and client is different, so there is never one right answer. With those factors nailed down, we can get to the fun part—pattern and layout. Most kitchen backsplashes are relatively small, so geometric patterns are best used with medium to small tile sizes. Any tile from a 1" mosaic to a large subway tile can work. If your pattern involves rotating tiles, as with a basket weave or Spanish bond pattern, we’ll need to make sure the grout lines meet up for a perfect installation. Where do we want the pattern to start? Usually the center line of the pattern will align with a major element in the backsplash, like the range or sink. We look at how the whole installation will work and decide the best spot. Varying color or texture is an excellent way to design a geometric pattern that is interesting but not too busy. Mixing gloss with matte is a more subtle design, while contrasting white with gray or black creates a bolder statement. Don’t forget the grout! Colored grout can be a big element in a simple pattern. Waste can become an issue with certain patterns, like chevron and herringbone. Any time tile must be cut, there is waste. We factor this amount into the cost of the install so that it’s not a surprise for our clients, but we are also aware that it impacts their budget. If you choose a pattern that requires cutting, make sure you order enough tile to account for the waste. Cost is a no-brainer. We know our clients have specific goals for their project and sticking to a budget is usually one of them. With an exciting pattern, cost-effective tiles can be just as design-forward as expensive tiles. But don’t sell your project short. There are many expensive-looking tiles out there that won’t break the bank, so have an open mind when researching. For instance, this textile-inspired Italian tile from Mutina looks super spendy but is actually quite reasonable as an accent. Any of the above showrooms will be happy to help you explore your tile options. My interior designer colleagues and I here at CRD also love guiding clients through the process of selecting tiles, grout, and accessories for kitchen and bath remodels, big and small. To learn more about our interior design and architectural services, give us a call at 206-782-6959 or fill out our online contact form.